You can make a difference for the most fragile animals in North Texas. With your support, Operation Kindness helps dogs and cats with severe medical issues receive the necessary treatment and surgeries needed so they will not only survive but live a life free of pain. 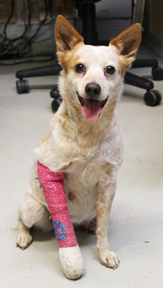 Special needs animals require surgeries for broken limbs, congenital defects, dental issues, and other issues. Many require special medicine, physical therapy, or other treatments to heal. Please give to support this special fund.